Students from 23 countries joined the Asian Institute of Technology (AIT) as the campus reopened for the January 2019 semester, with the new batch including a significant number who arrived as exchange students. Incoming students hail from Europe (France, Germany, and Hungary), Africa (Nigeria), and Asia (Bangladesh, Cambodia, India, Indonesia, Maldives, Myanmar, Nepal, People’s Republic of China, Thailand, Taiwan, and Viet Nam). The diverse range of students is reflective of AIT’s international orientation and partnerships. Eight European universities have sent their students to AIT under international exchange agreements. These include Polytech Nice-Sophia, EDHEC Business School, and Université Paris 1 Panthéon-Sorbonne (all of them from France); Technical University of Munich and Bauhaus University of Weimar (Germany); UNESCO-IHE Institute for Water Education (The Netherlands); and Budapest Technical University, Hungary. Additionally, students from Tunghai University, Taiwan have also joined AIT under a Double Degree Master Program, while another batch joined from Jawaharlal Nehru Technological University (India) under the Unified Bachelor-Master program. 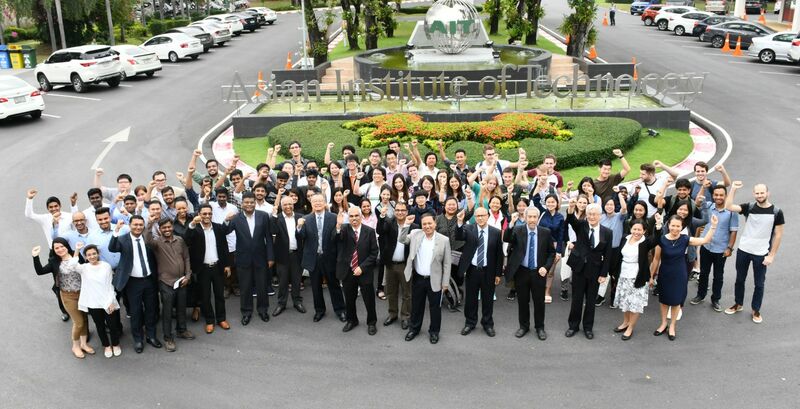 Welcoming the new students on Orientation Day on 4 January 2019, AIT President Dr. Eden Y. Woon highlighted the Institute’s international character as he delineated various new initiatives introduced at AIT. In particular, President Woon highlighted six strategic areas for AIT, namely I2E2S2: Innovation, International, Enterprises, Entrepreneurship, Stakeholders, and Support. In addition, Vice President for Academic Affairs Prof. Sivanappan Kumar, the Deans of all three Schools (Prof. Rajendra Shrestha: School of Environment, Resources, and Development; Prof. Pennung Warnitchai: School of Engineering and Technology; Prof. Nazrul Islam: School of Management), H.M. Kamrul Hassan, President, AIT Student Union, and Ms. Laarni Roa, Director, Office of Student Affairs also addressed the students. Incoming students were also informed about AIT policies on the Institute’s Student Code of Conduct, Ethical Behavior, and Harassment, Academic Requirements and Practices, Language Center Services and English Language Requirements, Student Welfare, Placement, Counseling, and Medical Services, Campus-wide IT Services, Educational Visa and Government Relations Services, Student Accommodation, and Facility Management.